The DRIERITE Compartment Desiccator solves the problem of humidity in closed compartments. Extremely dry conditions can be maintained in air tight enclosures by placing a Compartment Desiccator within the enclosure. 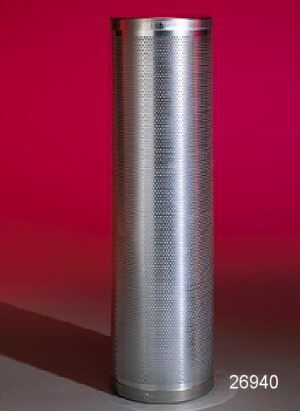 These inexpensive, perforated, aluminum cylinders serve to expose the DRIERITE granules to the air and bring about rapid water absorption. This unit is capable of drying volumes of up to 200 cubic feet. The desiccator is easily regenerated by placing the complete unit in an oven for 2 to 3 hours at 450° F.
Included with each compartment desiccator is a 10 - 60% Relative Humidity Indicator card. This card will change color to indicate the need for regeneration of the compartment desiccator.